To get a survey of the different ways people solve this problem in practice, I searched GitHub, Google and npm, and also took several polls via IRC and twitter. I hope that I managed to cover most of the popular libraries, but if there is anything here that I missed, please leave a comment and let me know. Broken: The library did not report correct results. Too much work: Setting up the library took too long. I was not as rigorous with enforcing a tight bound here, as I tended to give more generous effort to libraries which were popular or well documented. Libraries with 0 stars and no README I generally skipped over. Irrelevant: While the library may have at first looked like it was relevant, closer inspection revealed that it did not actually solve the problem of box intersection. This usually happened because the library had a suspicious name, or because it was some framework whose domain appeared to include this problem. As a control I implemented a simple brute force algorithm in the obvious way. While it is not efficient for large problem sizes, it performs pretty well up to few hundred points. rbush: This is one of the fastest libraries for box intersection detection. It also has a very simple API, though it did take a bit of time tuning the branching factor to get best performance on my machine. I highly recommend checking this one out! rtree: An older rtree module, which appears to have largely been replaced by rbush. It has more features, is more complicated, and runs a bit slower. Still pretty easy to use though. lazykdtree: I included this library because it was relatively easy to set up, even though it ended up being very slow. Also notable for working in any dimension. simple-quadtree: Simple interface, but sluggish performance. jsts-quadtree: Similar problems as jsts-strtree. Unlike strtree, also requires you to filter out the boxes by further pruning them against your query window. I do not know why it does this, but at least the behavior is well documented. Google’s Closure Library: This library implements something called “quadtree”, but it doesn’t support any queries other than set membership. I am still not sure what the point of this data structure is. generic-quadtree: Only implements point-in-rectangle queries, not rectangle-rectangle (stabbing) queries. quadtree: I’m don’t know what this module does, but it is definitely not a quad tree. Box2D: Probably the de-facto 2D physics engine, has been extremely influential in realtime physics and game development. Unfortunately, the quality of the JS translations are much lower than the original C version. Supports sweep-and-prune and brute force for broad phase collision detection. cannon.js: To its credit, cannon.js has a very clear API and well documented code. It is also by the same author as p2.js, so it is probably good. However, it uses spheres for broad phase collision detection, not boxes, and so it is not eligible for this test. GoblinPhysics: Still at very early stages. Right now only supports brute force collision detection, but it seems to be progressing quickly. Probably good to keep an eye on this one. PhysicsJS: I found this framework incredibly difficult to deal with. I wasted 2 days trying to get it to work before eventually giving up. The scant API documentation was inconsistent and incomplete. Also, it did not want to play nice in node.js or with any other library in the browser, hooking event handlers into all nooks and crannies of the DOM, effectively making it impossible to run as a standalone program for benchmarking purposes. Working with PhysicsJS made me upset. Matter.js: After the fight with PhysicsJS, I didn’t have much patience for dealing with large broken libraries. Matter.js seems to have many of the same problems, again trying to patch a bunch of weird stuff onto the window/DOM on load, though at least the documentation is better. I spent about an hour with it before giving up. ammo.js/physijs: This is an emscripten generated port of the popular bullet library, however due to the translation process the API is quite mangled. I couldn’t figure out how to access any of the collision detection methods or make it work in node, so I decided to pass on it. The code is available under a liberal MIT license and easily installable via npm. It should work in any modern CommonJS environment including browserify, iojs and node.js. In each of these experiments, a set of boxes was generated, and then sent to each library to compute a checksum of the set of pairs of intersections. Because different libraries expect their inputs in different formats, as a preprocessing step the boxes are converted into whatever data type is expected by the library. This conversion step is not counted towards the total running time. Note that the preparation phase does not include any time required to build associated data structures like search trees or grids; these timings are counted toward the total run time. Because algorithms for collision detection are output sensitive, care was taken to ensure that the total number of intersections in each distribution is at most , in order to avoid measuring the reporting time for each method. A limitation of this protocol is that it favors batched algorithms (as would be typically required in CAD applications), and so it may unfairly penalize iterative algorithms like those used in many physics engines. To assess the performance of algorithms in the context of dynamic boxes more work would be needed. Here is a summary of the results from this benchmark. For a more in depth analysis of the data, please see the associated GitHub repo. All figures in this work were made with plot.ly, click on any of the images to get an interactive version. At this point, the performance of brute force begins to grow too large, and so it was omitted from the large brute force tests. Because p2’s sweep method uses an insertion sort, it takes time with a cold start. This causes it to perform close to brute force in almost all cases which were considered. I suspect that the results would be better if p2 was used from a warm start or in a dynamic environment. 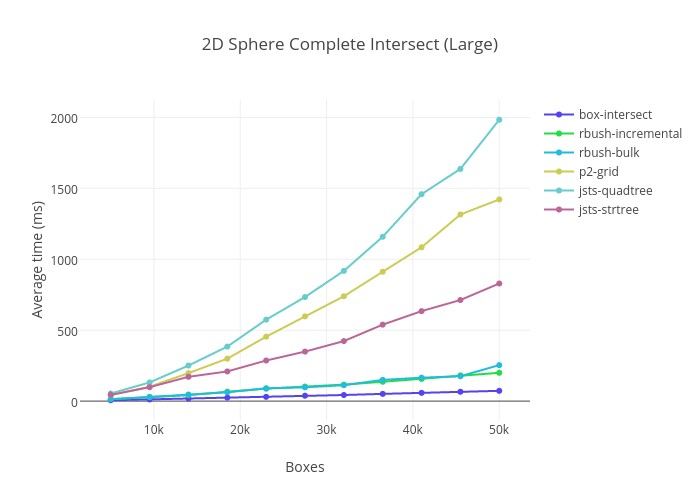 Both of jsts’ data structures continue to trend at about growth, however because the constants involved are so large they were also dropped from the large problem size. 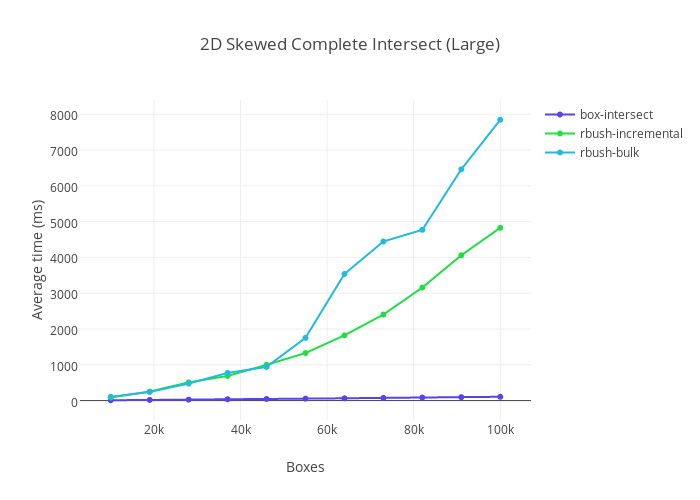 As expected, somewhere between 10000 and 20000 boxes, p2-grid finally surpasses box-intersect. This is expected as grids realize complexity for uniform distributions, which is ultimately faster than for sufficiently large . The OMT heuristic partitions the space into an adaptive grid at each level of the tree along the quantiles. 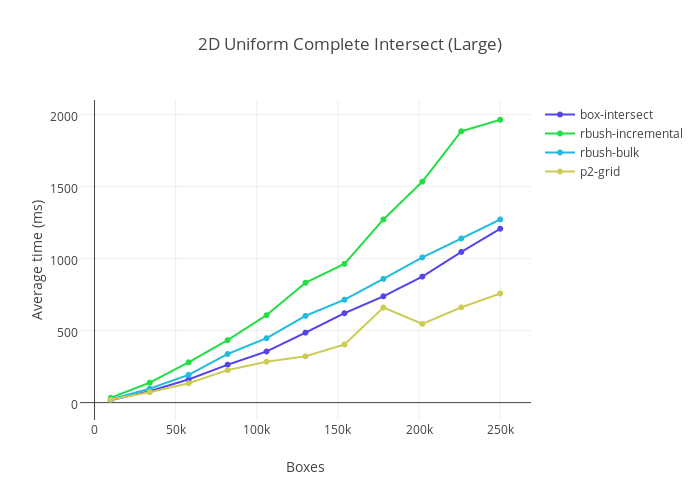 In the case of a uniform distribution of boxes, this reduces to uniform grid giving a query time of , which for finite gives means that rbush will find all intersections in time. 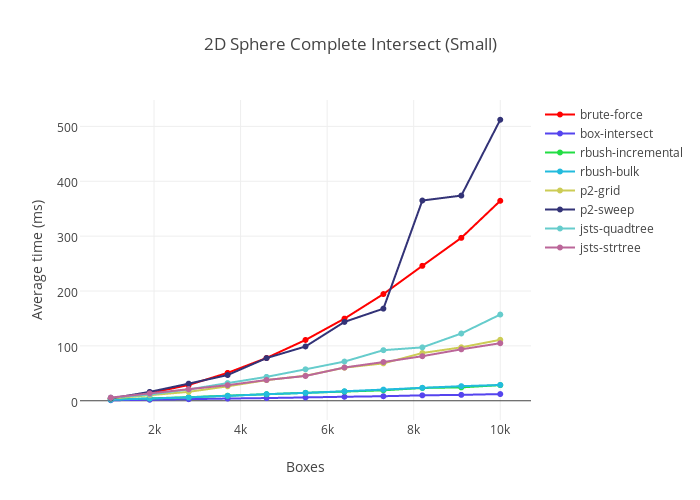 As a result, we can expect that once , rbush-bulk should eventually surpass box-intersect in performance (though this did not occur in my benchmarks). This also suggests another way to interpret the OMT heuristic: it is basically a hedged version of the uniform grid. While not quite as fast in the uniform case, it is more adaptive to sparse data. Of course realistic data is hardly ever uniformly distributed. In CAD applications, most boxes tend to be concentrated in a lower dimensional sub-manifold, typically on the boundary of some region. As an example of this case, we consider boxes which are distributed over the surface of a sphere (again with the side lengths scaled to ensure that the expected number of collisions remains at most ). A collection of boxes distributed over the boundary of ball. Again, brute force and p2’s sweep reach similar performance. Both p2-grid and jsts-quadtree diverge towards , as grid based partitioning fails for sparse data. One way to understand the OMT heuristic in rbush, is that it is something like a grid, only hedged against sparse cases (like this circle). In the case of a uniform distribution, it is not quite as fast as a grid, suffering a penalty, while adding robustness against sparse data. 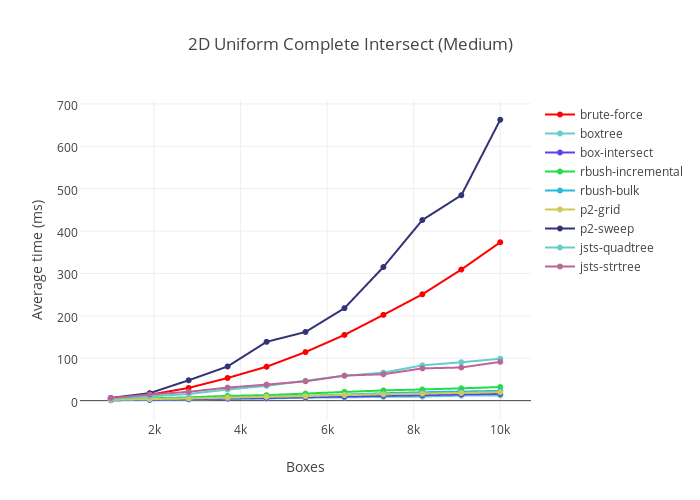 Again box-intersect delivers consistent performance, as predicted. In this case rbush-bulk takes more than 40x slower and rbush-bulk more than 70x. Unlike in the case of grids however, these numbers are only realized by scaling in the number of boxes and so they cannot be made arbitrarily large. However, it does illustrate that for certain inputs rbush will fail catastrophically. box-intersect again continues to grow very slowly. 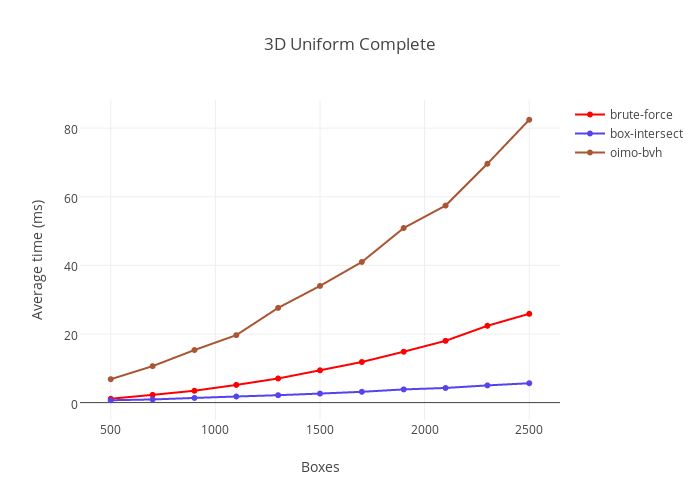 For large, uniform distributions of boxes, grids are still the best. For everything else, use segment trees. Brute force is a good idea up to maybe 500 boxes or so. Grids succeed spectacularly for large, uniform distributions, but fail catastrophically for anything more structured. Quad trees (at least when properly implemented) realize similar performance as grids. While not as fast for uniform data, they are slightly hedged against boxes of wildly variable size. RTrees with a tuned heuristic can give good performance in many practical cases, but due to theoretical limitations (see the previous post), they will always fail catastrophically in at least some cases, typically when dealing with boxes having a high aspect ratio. Zomorodian & Edelsbrunner’s streaming segment tree algorithm gives robust worst case performance no matter what type of input you throw at it. 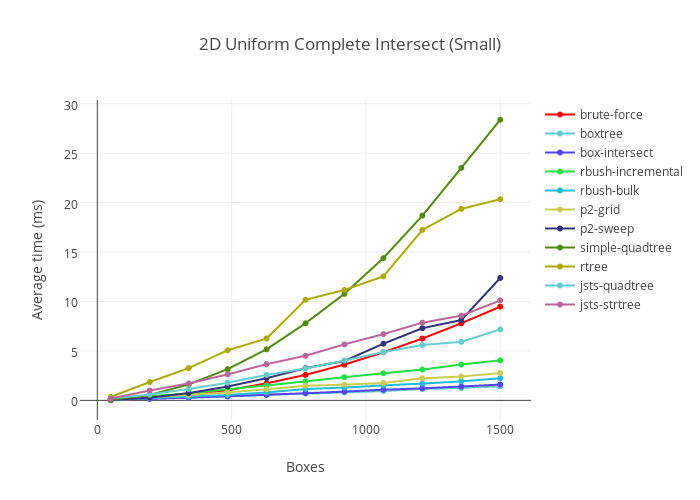 It is even faster than grids for uniform distributions at small problem sizes(<10k) due to superior cache performance. Overall, streaming segment trees are probably the safest option to select as they are fastest in almost every case. The one exception is if you have a large number of uniformly sized boxes, in which case you might consider using a grid. This entry was posted in Collision detection, Geometry, Mathematics, Programming. Bookmark the permalink. I’d love to see part 4 with insertion/removal time comparisons! This was my main focus when developing rbush since insertion rather than search was a bottleneck in all use cases I use rbush in. Thanks for the comment and for making such a great library! A dynamic test would be pretty interesting, but I don’t have enough energy to do it right now. Still I would love to see someone take on this problem and am curious what the results would be. Could you flip the charts to show collisions per second? The best libraries are all squashed down at the bottom and it’s hard to see which one is really better. OTOH it wouldn’t be a problem if useless libraries were asymptotically approaching 0. Awesome article. 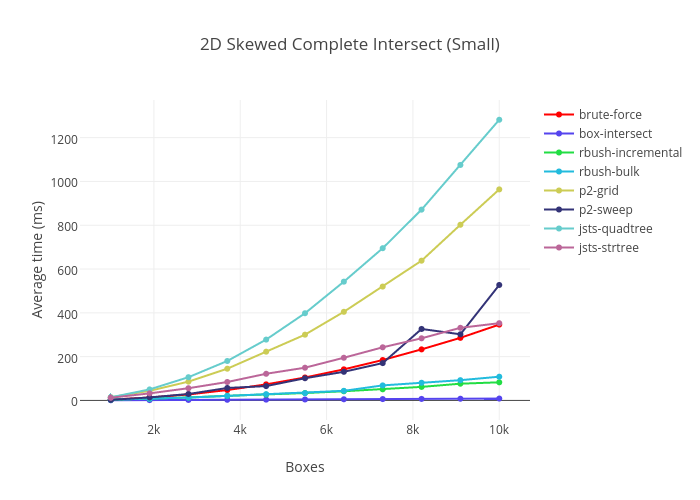 I’m really impressed by the benchmarks, especially for box-intersect. 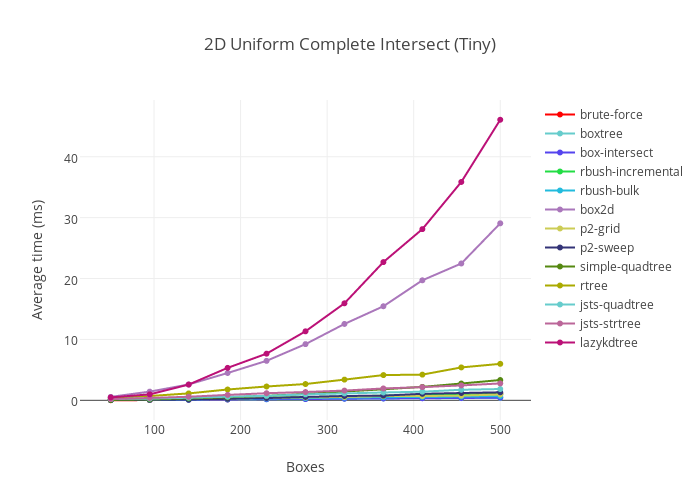 I am wondering though to what extent something like box-intersect can be used as a heuristic for doing collision detection on objects that may or may not be boxes. Suppose you had a scene with an arbitrary number of shapes of arbitrary types (some are boxes, some are balls, and some are convex polygons). At what point does it become interesting to bound the shapes that aren’t boxes by a minimum bounding box, and then if the bounding boxes collide then apply an appropriate algorithm for those shapes? This is something which I have wondered about, and don’t really have any good answers for. What I can say though is that in practice it seems to be a common strategy. Many physics engines and CAD kernels use boxes as their bounding primitives (for example Box2D, Bullet, etc. ), so I think that there is at least some evidence that it works. However, I still haven’t seen a more rigorous analysis of this strategy, especially for 3D shapes. That’s interesting. I think that it is an avenue worth exploring. Given that now issues like battery usage have started to become a concern, I think it’s necessary to explore more aggressive heuristics and strategies to try to do as little computation as possible while still being able to simulate as much as possible. I hope you don’t mind if I tinker with box-intersect while I explore trying to apply it to do collision detection on more complex shapes. Wow, great article! Nice work. And thank you for the compliments regarding p2.js and cannon.js! I know you already mentioned it, but I want to stress it even more: the sweep and prune (SAP ) algorithm in p2, cannon, Bullet and other rigid body simulators are only efficient in the warm start case. It’s ideal for simulations longer than one time step, especially if the characteristic velocity is small. Very interesting article, thanks for writing it! If I understood correctly, the problem was to report all pair-wise rectangle-rectangle intersections, correct? May I ask you about a different problem, namely for given a rectangular window report all rectangles overlapped by it, what algorithm/data structure/library would you suggest? Is there a broad name for the box-intersect algorithm? I’m attempting to do some research on it however it seems to be very sparse.